Even when my progress is in fits and starts, I enjoy the process of revisiting an old technique and adapting it to another fabric. In a recent newsletter I included two links to previous posts about “taming bulky seam allowances” so, I suppose, that topic has been very much on my mind. It's a common issue when working with bulky sweater knits. One thing I always consider is the squish factor. (Not a technical term, my definition of squish factor is the ability of a fabric to be easily squished or flattened.) The squish factor is usually greater with bulky wool than with bulky cotton. A thick, bulky wool is often full of air. It can have the magic power to squish down really well. It will flatten nicely when sewn and stay flattened. Cotton, however, is heavier. Lovely as a cotton knit is, there’s often a lot more actual fiber there, not just an appearance of loft. Certain cotton knits have what I consider to be a low squish factor. In other words, they don't squish down well. Finishing a seam allowance on fabrics with this much bulk and a low squish factor sometimes requires extra work, which I rediscovered with this project. 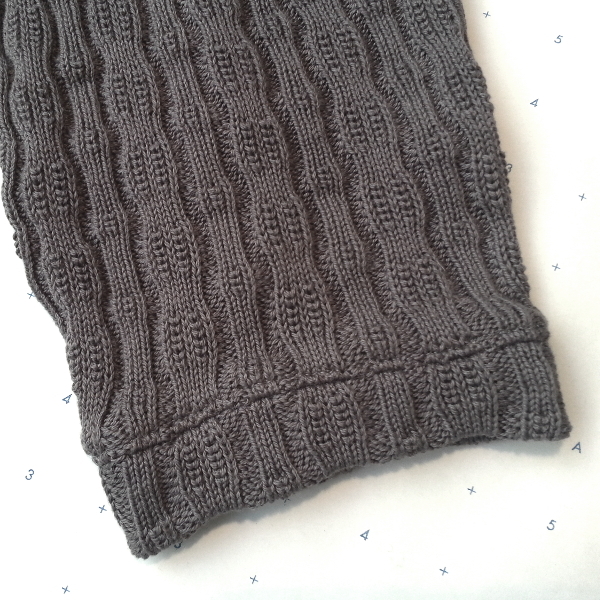 I've been working to complete a sweater in luxurious gray Cobblestone sweater knit fabric. The sweater began as a sample for a cut and sew presentation I made in April. 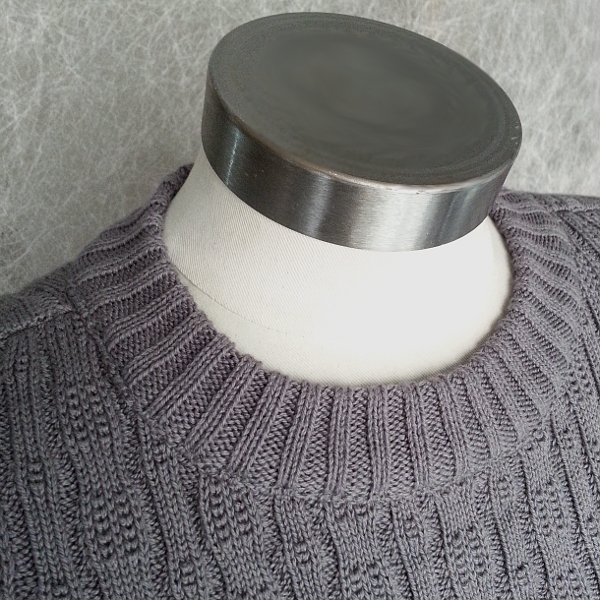 For this sweater I decided to enclose the cut neckline with a double neckband. I’ve found that top stitching when enclosing a raw edge is often useful when there are thick layers. Because I enclosed the raw edge (pictured above), I steamed the seam allowance upward. If I had been using a simple binding at the neckline, I would've started without any seam allowance at all and wrapped the binding fabric closely around the neck edge. In this case, however, I’m making a crew neck with a 1.25” band. After sewing the seam, I sewed allowances together with a 3-step zigzag, in order to make the seam allowance flatter. My intention was for the zigzag to keep the seam allowance flat. I then trimmed the seam allowance close to the zigzag stitches. I now believe that grading the seam allowance (trimming the top layer of the seam allowance a little more than the bottom layer) before zigzagging might have been a better way to go. Don't get me wrong; I’m quite happy with the neatness of the neckline, but I know what I'll do next time. Enclosing the seam allowance isn't necessary, as I demonstrated in my post Sewing a Finished Edge Rib Band to a Sweater Neckline. For that demo I used a relatively narrow, single band. A neatly finished seam allowance would be quite acceptable in that situation. Here's the beautifully wide, single band treatment that Debbie Iles of Lily Sage & Co used with cornflower blue Cobblestone. Because it's a single band, there's not as much bulk at the seam. In her blog post Debbie gives us a peek into her process as she develops her final look. Her finished dress pairs the Cobblestone sweater knit with a wonderful woven linen. Since I love discussing process, I really enjoyed following the documented steps Debbie takes in her project. Check it out. Debbie's final dress is gorgeous. Returning to my sweater-in-progress, I've used a band of self fabric for the sleeve finish. It turns out my sleeve seems a little long. I may be reworking it. Not sure yet. The sweater's almost finished now. I’ll be sure to post pictures when it's done!